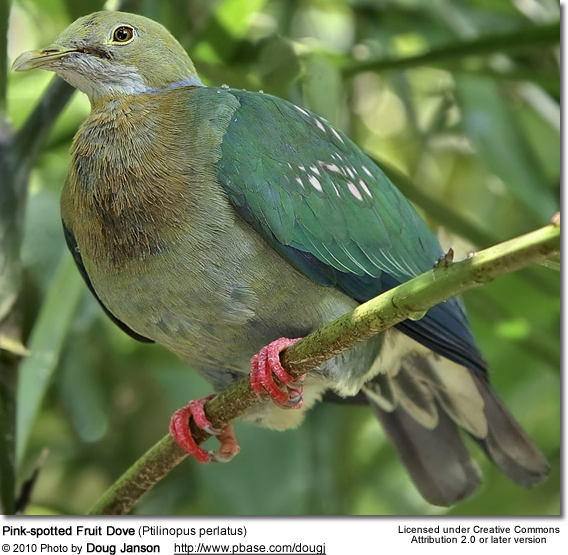 The Pink-spotted Fruit Dove (Ptilinopus perlatus) occurs naturally in forest and woodland in lowland and foothills of New Guinea and nearby smaller islands. It is widespread and generally common within its range. The Pink-spotted Fruit Dove is mostly green that has been named for the pink spots on its wings. The chest is browner and duller. The throat and nape (back of the neck) are greyish white. 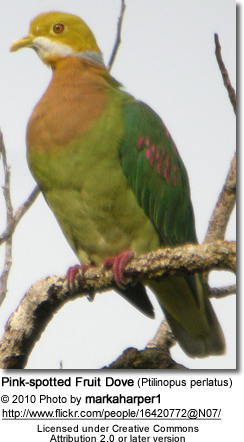 As most other fruit-doves, it is largely green. The chest is duller and browner, and the throat and nape are grey-white. The face and crown are usually olive-green, but this is replaced by pale grey in the north-eastern subspecies plumbeicollis.